Whether you’re packing a deli picnic to enjoy at the lake or grabbing a Subway® sandwich on the way to a ball game, chances are you’re enjoying Iowa-raised turkey. “The rising popularity of sandwich chains means more Americans than ever are enjoying turkey that was produced by West Liberty Foods in West Liberty, Iowa,” explains Jared Achen of Achen Farms, a third generation Iowa turkey farmer who is a member-owner of the West Liberty Foods cooperative. Today 75 percent of turkey is eaten year-round, which is a significantly different trend than when Jared’s father started raising turkeys. In 1970, 50 percent of the turkey eaten in the U.S. was enjoyed during the holidays. Iowa turkey producers have learned to consistently produce turkey year-round to keep up with the rising demand. That’s good news for rural communities and the farm families who wish to keep farming the land that’s been in their family for generations. The Achen’s turkey operation plus their corn and soybean enterprises support five families. “We have an amazing team that helps us grow and maintain our operation. 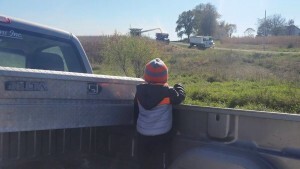 It truly takes a village to run a farm and raise a family. We’re blessed with great full-time and part-time help,” says Jared. After earning a bachelor’s degree in Ag Business from Iowa State University in 2011, Jared returned home to Henry County. He married his high school sweetheart, and they became independent turkey farmers. 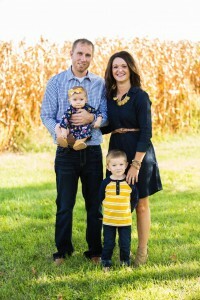 Jared and Tawnya feel blessed to be growing their farming operation and raising their two children, three-year-old Brecken and 1-year-old Tenley, in the beautiful rolling hills of Southeast Iowa. 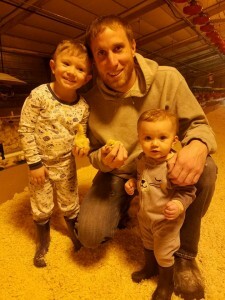 Jared and Tawnya built their first turkey farm with two barns in 2011. Then they expanded in 2015 by building one new barn. In 2017, they purchased another farm that added three barns. Caring for turkeys and watching them grow is a rewarding endeavor for the Achens. 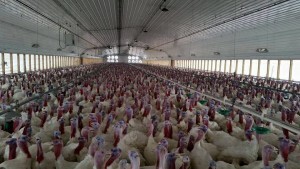 Turkeys arrive when they are 1 day old and grow quickly for 19 weeks until they are finished at about 44 pounds. 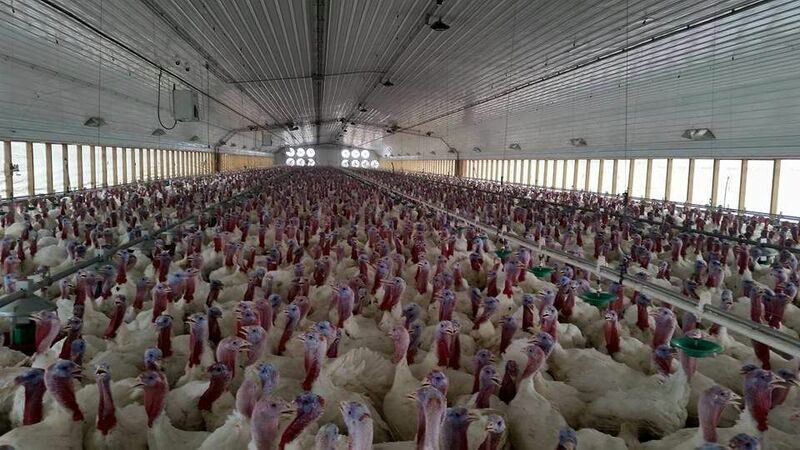 Like other livestock enterprises, good management is key for turkey production. A consistent daily routine of feeding, evaluating the turkeys, checking ventilation, and applying new bedding is vital to producing top quality birds. 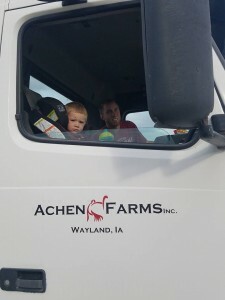 Although the turkey and row crop operations keep the Achen family busy seven days a week, they still find time to be involved with their community. Jared and Tawnya hold positions within their church and volunteer at school events. Jared also is a member of the Wayland Economic Development Committee and serves on the Henry County Farm Bureau board. 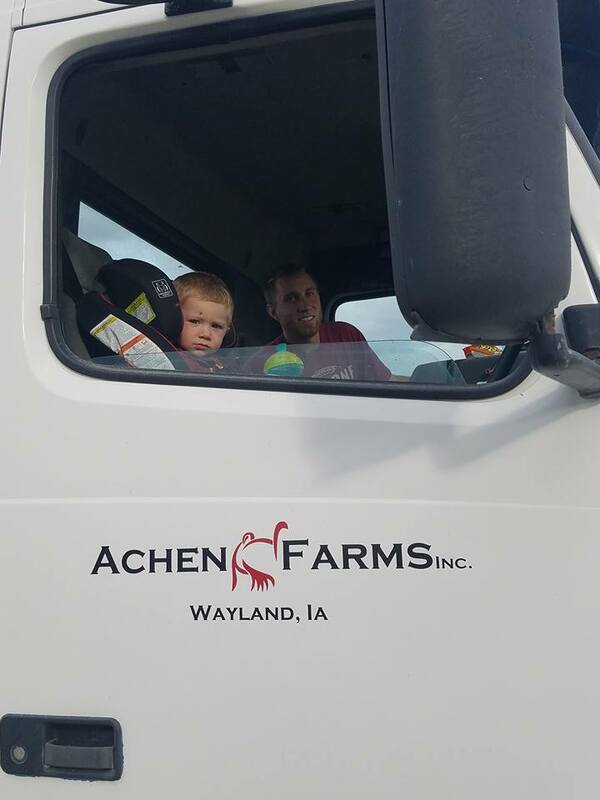 The Achen family also shares their farm life by posting frequently on the Achen Farms Facebook page. Another way they connect with consumers is through the Midwest Old Threshers, which draws people to the area each Labor Day weekend. The Achens set up an turkey booth within their church tent where they serve turkey drumsticks and turkey tenderloins. 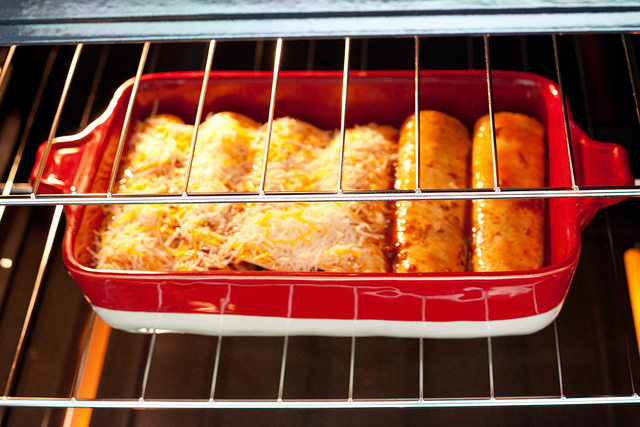 Today the Achens are sharing with us one of their family’s favorite recipes for turkey enchiladas. Download this recipe and celebrate June Turkey Month with your family! Mix everything together – except the turkey and cheese – in a bowl. Spread about 1/8 cup of the mixture evenly onto a tortilla shell; add in a handful of turkey and cheese. Roll the shell up and place seam-side down into a 9x13 pan. Repeat that process till all your shells are filled. Pour any leftover mixture on top of the shells. Bake in oven at 350 degrees for 45 minutes. COOK’S TIP: You could remove the casserole dish with 10 minutes remaining and sprinkle additional cheese on top, if desired.